May Day can be a such a special day in a family and at school. 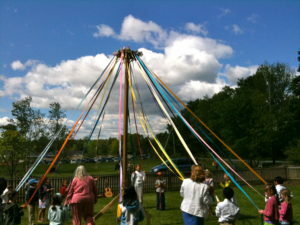 My first recollection of celebrating May Day was in a local preschool where we 4-year-olds went around a simple May Pole each holding a ribbon. I was dressed in a handmade costume—a robin. I still remember the feelings of awkwardness as the teacher encouraged me to flap my wings as we paraded outdoors. I envied my twin sister who wore a flower costume. Our grandmother took movies of us, which we viewed years later. 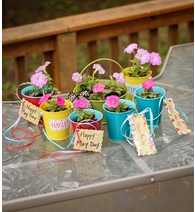 When my own children were preschoolers, I taught them how to make May baskets as a surprise for our neighbors. The residents on either side of us were elderly and this gesture would bring them such delight. 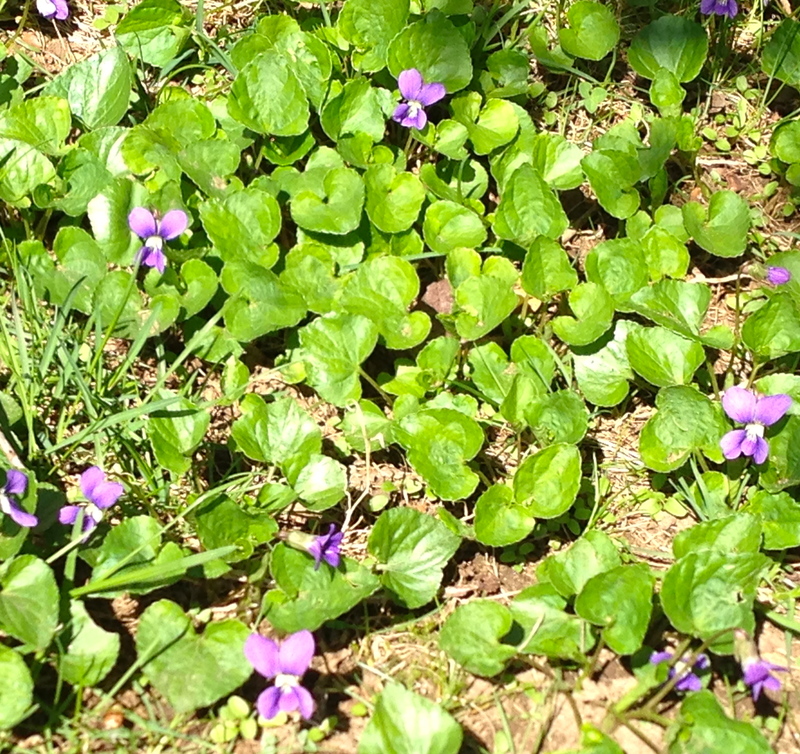 In New England we didn’t have much in the way of blooming flowers – perhaps some crocus, forsythia, wild violets creeping through our grass, or bright dandelions. The styles of our “baskets” varied from year to year. Some were made out of small cans, empty frozen OJ containers, rolled colored construction paper lined with a plastic bag, paper cups and occasionally a real basket lined in aluminum foil. Each was finished with one or more colored ribbons for a handle. I’d wake the girls up early and before breakfast, they would sneak outside, run over to the neigbhor’s yard and hang the basket on the door handle and run right back home. We never left a message or a card. Part of the fun was the anonymity of it, although I knew it wouldn’t take the neighbors long to figure out who their gift-givers were. All were delighted. It was a simple gesture on our part and I hoped it would be another example for the children of how to be kind to others. When we discovered Waldorf education and our youngest attended the Marin Waldorf School, we discovered that the school had not only a May Faire, but a tall May Pole around which each of the classes would dance. Before the Faire, the class teachers would instruct the children in simple steps for going around the pole. Imagine my delight when parents were invited to take a ribbon and go round, too. The upper classes had more complicated patterns and the final dance always ended up with the ribbons completely wound up in a beautiful pattern tight against the pole. The day before the May festivities, parents would bring in whatever vines and flowers they had in their yards or had purchased. The counters in the classrooms would be overflowing with the bounty. Parents would help the children make circular garlands to wear on their heads during their time around the May pole—boys wore them, too. All were sprinkled with water, put into a large plastic bag and placed in the refrigerator overnight to keep them fresh. Over the years, I have seen or participated in several May festivities at Waldorf schools and always been interested in the ribbons. Some were beautiful pastel wide satin ribbons, carefully ironed each year. Others had easy-to-hold grosgrain ribbons in bright crayon colors. Ideas for making baskets can be found on the internet. The one I’ve added is from Pinterest. The bright red one at the top was given me in 2011 by the neighbors, a family with triplets. My turn to be the recipient. Don’t just make them today—do it all through the gardening season! Can you let me know how YOU celebrated May Day? This entry was posted in News and Announcements, Pam's Perspectives and tagged Activities, Celebrations, Crafts, Family Life, Nature, Spring. Bookmark the permalink. Both comments and trackbacks are currently closed.